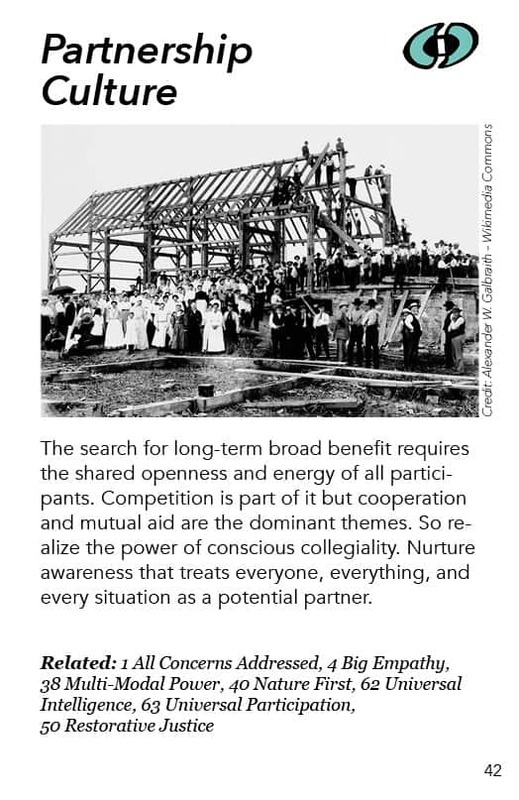 The search for long-term broad benefit requires the shared openness and energy of all participants. Competition is part of it but cooperation and mutual aid are the dominant themes. So realize the power of conscious collegiality. Nurture awareness that treats everyone, everything, and every situation as a potential partner. Long-term broad benefit is not going to be a top-down operation. It is not going to involve one group pulling it all off. If we want to generate long-term broad benefits over and over again, there needs to be a mixture of shared forward energy and orientation – with co-creative and other resources brought together – and there needs to not be a lot of unnecessary resistance, cross-purposes and friction in the system. This requires a society that is grounded in working together. There are ways in which competition can be part of that. The Olympics is an interesting example of competition supporting collaboration. All the countries are working together to evoke the best performances of their prized athletes. One of the theories of the free market is that competition feeds innovation, efficiency and all the rest. This is good as long as we understand that the fundamental thing we need at this stage of humanity’s development is working together, helping each other out. That goes not just for our relationships with each other but our relationships with the natural world. Are we working as partners with nature? Do we become an integral part of nature? For example, we have this activity called “recycling”. But nature has been recycling things for ages: there is no waste in nature. When one part of nature gives off something, another part picks it up and uses it. So when we do our “recycling” of various products we’ve created, we are joining and partnering with this larger cyclic activity of nature and its dynamics. Permaculture principles are designed to help us partner with nature. It’s like: How can we become part of a designed ecosystem where every part is both contributing and benefiting, including us. This is instead of thinking, “This is a dead land that we are going to pour fertilizer on it and extract plant material from it as if we are mining it.” In permaculture there is a sense of not dominating or fighting against nature but working with it at every level and every step of the way. How can we deal with situations this way? If we have a conflict, for example, we can use that conflict creatively if we work together on it. We can resolve it and, in the process, deepen our relationship, deepen our understanding of each other. There’s a saying that “If life gives you lemons, make lemonade!” The idea behind that is that there are lessons and capacities, potential gifts, etc., buried in situations. We can be humbled by crises, and we can be gotten out of our houses. A book called Paradise Built in Hell describes how in earthquakes and other local disasters people come out of their houses and help each other and provide spontaneous services to their community. This is a natural response that happens almost all the time in such situations. What can we learn from that? How can we support that kind of energy – where when we are facing a crisis, we engage in community and mutual aid? It’s like our society has set us up to be in our little boxes and when we are forced out of our boxes suddenly we are there with each other. So everyone, everything, every situation can be viewed as a partner, an ally, an asset, if we choose to view it that way and work with it. That means seeing it as not as an obstacle, an opponent, or a dead piece of matter but as a companion or partner, as something or someone that has something to contribute to whatever we are trying to do if we treat it right. We want to make sure that the needs of our partners are being met along with our needs. We aren’t faking partnerships so that we can manipulate things and get our own way. We are seriously partners. We understand literally that there is a give-and-take in any partnership and the more we can understand each other’s needs including the needs of nature and natural systems and what’s needed in each situation for resolution, the more we can become high-quality partners and actually succeed in benefiting them and us in whatever the scene is. That “benefiting them and us” is what the “broad benefit” of wise democracy is all about. The “long-term” part of it is that we are going to partner with the future. Many social change and ecological activists bring children into their activism. Children represent and embody our future and what we’re supposed to be all about. When they speak in their often simple language – and sometimes startlingly sophisticated language and sometimes a combination of the two – it leaves us in awe and needing to get our act together because we’re moved by that. So that’s another example of the long-term. We are partnering with the future and the future has things to offer us and things to say to us and for us. The Partnership Way is a book by Riane Eisler which promotes partnering between the values originally viewed as masculine with those typically viewed as feminine (which in many cultures are considered less valuable). The aim is to overcome these patriarchal belief systems and dynamics to promote a spirit of partnership – especially between men and women – in all spheres of society. Permaculture is a form of partnering with nature. Some of the permaculture principles are now being applied by permaculture practitioners – of which there are thousands – to community and society. They are asking, “How do we design a mutually beneficial community of people using some of the understandings we have from designing mutually beneficial permaculture gardens?” Permaculture sees everything as a potential resource for the life and productivity of a living system. Open Space is a process designed around partnership. If you stand up and say what you’re passionate about and other people are passionate about that same thing, they join you in a discussion or working group to further what you’re all passionate about. That can have lasting effects. It’s about getting people together who want to merge their life energy into a shared interest. Future Search is a way of bringing together stakeholders, people who are involved in a situation or conflict. Once we get them together, they look at what they would all like to see happen and then they create teams to work on different parts of it, usually ones where they can use their particular skills and/or passions. 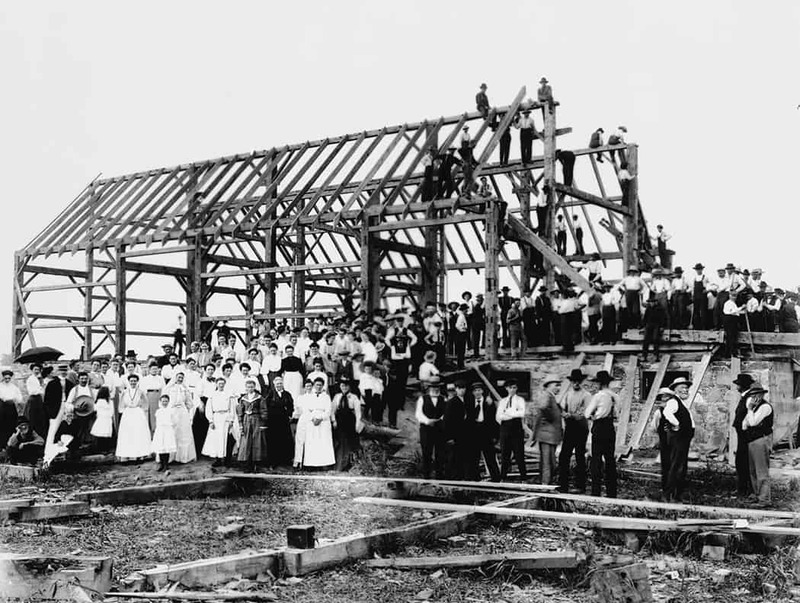 Each person can promote their particular piece of the future they all want to build together. Coalition building is a traditional community organizing and social change organizing approach. You find other organizations and people who are aligned with your goals even though they may be different from you in many other ways. In this one project or issue you see and treat them as partners. For example, you can get people who are far left and far right working together to resist the surveillance state. The libertarian right and the progressive left don’t like the surveillance system. Similarly, when my wife and I homeschooled our daughter for a year and a half, we were surprised to discover that the homeschooling movement was made up primarily of hippies and Christian fundamentalists. It was an interesting coalition to fight together for the legal space within which to do homeschooling. Anarchism – For many years I thought anarchists advocated no control of anything, just “throw bombs and sow chaos!” Then when I was on the Great Peace March in 1986 across the US I was surprised to discover that the anarchist contingent on the march was the most organized group. They were experienced and sophisticated in cooperation. They knew how to work together. I learned that what they’re against is enforcement and systems that dominate. They are not against people working together and they don’t like destructive chaos any more than the rest of us do. They want to generate a workable living system. Mutual aid is one of their fundamental principles. So that was an eye-opening experience for me 30 years ago. Recently I’ve learned more about the gift economy and about people working together by experiencing gift circles. You have 10 or 20 people in a circle and you go around and each person says, “Here are things I need” and then in another round they say, “Here are things I can offer.” Suddenly all these connections show up. I had a housemate who turned out to be a cartoonist. Although I’d known her for almost two years, I had no idea she had that capacity. So we worked together on a cartoon series about wise democracy. We didn’t end up succeeding, but it is a great example of a sudden match where there wasn’t anything before. Through experiences like that I realized there is an abundance of stuff and capacity waiting for us below the boxes we put people into and the assumptions we have about them. They’re much bigger than that! The sharing economy – It’s obvious that we don’t all need to have our own lawnmower. All the lawnmowers just sit around. When we are able to share what we have, suddenly there are resources, and we can work together to discover the resources that are sitting around unused, in isolation, and not cared for. As with the gift economy, we suddenly become more abundant and more wealthy. We discover our true “commonwealth”. And then there’s the networking software sites. They are less about going around with business cards, and more about finding each other for shared action and shared benefit. The more we create a society which is filled with that kind of activity, the more we are capable of finding futures that work together. That benefits us all over and over again, and that’s what this wise democracy is all about.